Yum! This dish is so good and creamy and sooooooooooo easy! It's the perfect thing to warm you up on a cold winter day. 1 Bag Quorn Chick'n Tenders or if you don't like Quorn, don't eat eggs or wanna go gluten free: 1 Block of extra firm tofu cubed and sauteed. Tip: If you're not buying organic, read the package, sometimes there's weird preservatives mixed in. Yuck! Combine the mushroom soup, sour cream, green chiles, and spies. Stir it on up! Mix in the frozen bag or Quorn or the sauteed tofu. 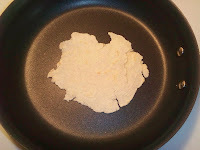 Line the bottom of an 8 x 8 class casserole dish with the tortillas. 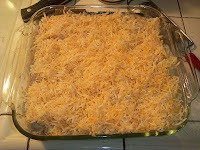 Next add the "Chicken" mixture, then a layer of cheese. Do it all again! Tortillas, "Chicken" mixture and Cheese. Tah dah! Stick it in the oven until golden brown and bubbly. 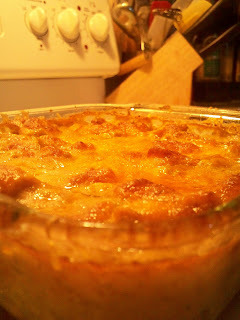 You'll end up with a warm an filling casserole that is a whole meal in its self!!! Enjoy!